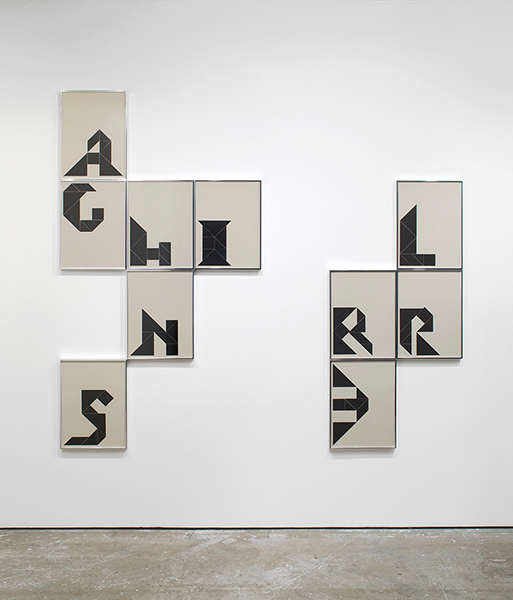 The exhibition takes its title from Anna Barham’s project, Step Into Tangram Rule (2010) which focuses on the Tangram, a Chinese puzzle in which a square is cut into seven pieces that can be recombined to make many different figures and shapes. 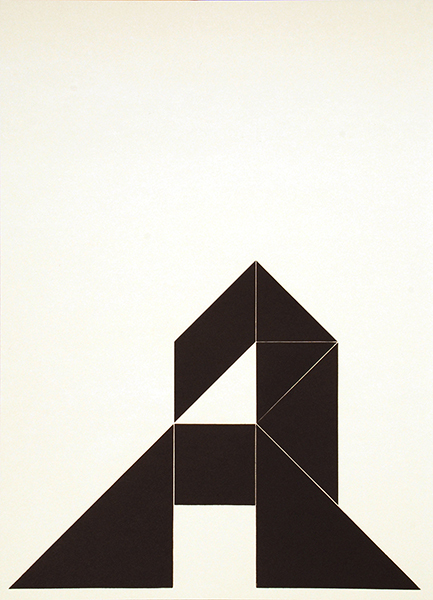 Although many Tangram puzzles were published during the game’s popularisation in Europe in the early 19th Century, the figures tended to be geometrical or representational and only rarely included alphabets or numbers. 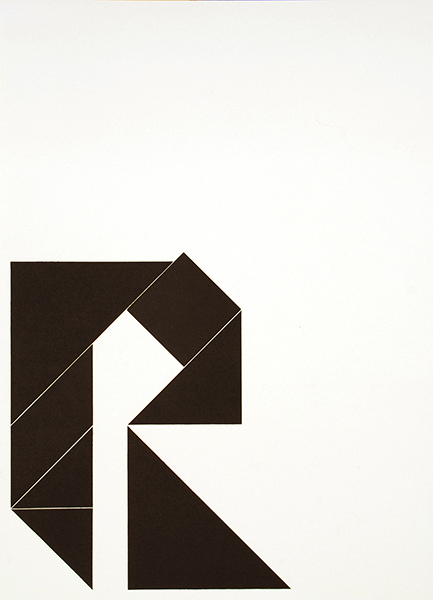 Step Into Tangram Rule, which in total comprises 191 prints, charts the history of these Tangram letterforms and numerals as well as Barham’s own designs. The prints are made by inking a set of the seven tangram tiles and sending them through a press – symbols made and remade from the same set of components so that the puzzle can eventually be used to create our writing system: 26 letters and 10 numerals, boiled down not to 1s and 0s as in digital code, but to physical arrangements of 7 basic geometric shapes. On show here is one section of Step Into Tangram Rule: the ten letters designed by Henry Dudeney (“Sphinx”), a mathematician and puzzle designer, for the titles of puzzle columns in the Strand Magazine (1908- 1917). He designed two unique Rs but his solutions for E, M and T had been previously published by Söhlke (1859), Bertinazzi (1818) and Muller (1810) respectively and so are not duplicated in this set. John Finneran’s new painting The Middle of the Night is empty of the faces, continuous bodies and classical three figure compositions that were, until recently, his recurrent motifs. Body fragments are still present, but abstracted by degrees and simplified as arcs, triangles, crescents and circles. 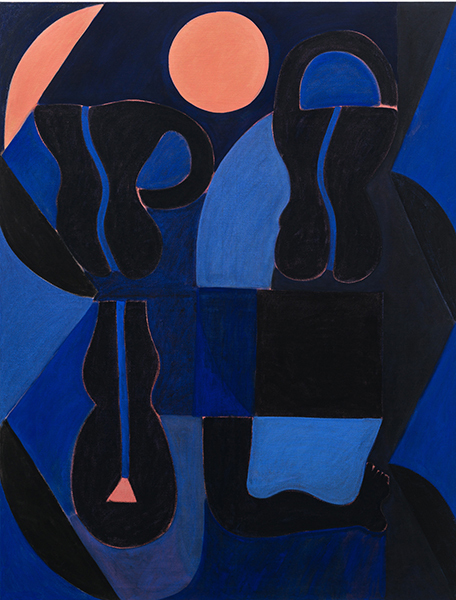 This distillation of forms creates a live surface where shapes oscillate between figure and ground, recalling the sensation in a child’s hand locating a block in a shape sorter – a moment of fit, of eye and hand, of self and world coming together. The removal of historical references or any kind of ornamentation from the paintings, brings them even closer to feelings than ideas and into the present moment of encounter with the viewer. John Wallbank has long been interested in the relationship between drawing and sculpture and seeks to parallel the direct relation of mind to hand offered by drawing through other materials. Recent work has also explored parallels between building and painting by using material as an analogue for colour or considering how colour might be given physical functions to perform. Such functions might include: differentiation – aiding legibility by identifying parts within a whole, unification – erasing unnecessary differentiations, enhancement – of the materials used or, conversely, their generalisation and abstraction. Wallbank’s new work Untitled responds to the play established by the shape shifting works of Barham and Finneran: five individually modified units join to become an ad hoc building system in which faces, feet and angled limbs combine to form a body of colour-coded parts. These building parts are used as physical blocks of colour which stack and overlap to give coincidental details, one face eclipsing another while suspended surfaces either frame or obscure what lies behind. The touching faces are both drawn on and drawn together by their connecting wire lines.